Bullying and adolescent dating abuse are issues prevalent in the lives of young people. Whether these forms of violence are happening on or off school campus, the negative impacts are far reaching and creates an environment that is not conducive to learning or to the overall well-being of students. These issues are also connected. For example, research has shown that students who have engaged in bullying behavior and who have themselves been bullied are more likely to experience emotional and physical adolescent dating abuse. We also know that bullying and adolescent dating abuse share risk and protective factors. All students deserve to feel safe and able to learn at school, and schools play an important role in addressing and preventing both of these forms of violence. A new policy brief from the California Partnership to End Domestic Violence (CPEDV) titled Addressing Bullying and Adolescent Dating Abuse: Supporting Healthy Relationships in Schools outlines the prevalence of and connection between bullying and adolescent dating abuse. The policy brief provides school administrators with considerations, questions, and strategies to guide the process of expanding and strengthening existing policies and encourages comprehensive prevention efforts. Training school staff to recognize the signs of abuse, educational opportunities for students that focus on healthy relationships, and ongoing communication with parents and caregivers are all examples of how schools can foster a supportive and connected school community. 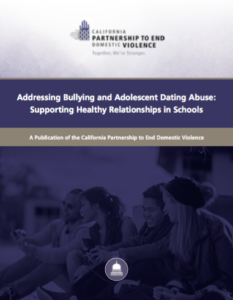 Given the interconnectedness of bullying and adolescent dating abuse, schools must address both issues to create healthy and positive school environments that allow all students to feel safe, included, and accepted. Doing so will have a positive impact on the health and educational outcomes for students now and in the future. Download the brief from CPEDV here.